More and more Associations throughout California are considering the implementation of alternative energy sources as a mechanism to reduce their operating expenses. An Association in San Jose will begin construction on the largest solar water heating project in the state later this month in an effort to reduce its water heating bills. The Association is comprised of 320 residential units and uses an average of 10,000 gallons of hot water per day for showers, dishwashers, laundry and other residential purposes. By switching from natural gas to solar energy for their water heating needs, the Association expects to reduce its water heating bills by as much as 60%. The project will benefit significantly from the new California Solar Initiative (CSI) Thermal Program which provides the Association with rebates valued at over $185,000. These rebates will help offset the costs of installing a total of 183 commercial grade solar hot water collectors to be mounted on five roofs of the Association’s buildings. Homeowners Associations in California may want to explore the feasibility of implementing alternative energy within their communities. Some CC&Rs may restrict or prohibit these installations; however, any such restrictions flatly prohibiting solar panels and supporting equipment are null and void in California. If you would like some guidance on this issue, contact our offices to discuss with one of our attorneys the options available to your Association. 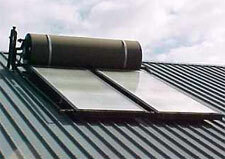 To visit the solar system manufacturer’s website, click here.